San Diego is known for sunshine, sand, surf and sea, but come the end of October, the city puts on a fabulous Halloween display all throughout the Historic Gaslamp District. Although the typical conversation regarding southern California’s city of San Diego centers on beaches, vitamin D and your favorite fish taco spot, there are also those mysterious and spooky spots to visit throughout the entire year. 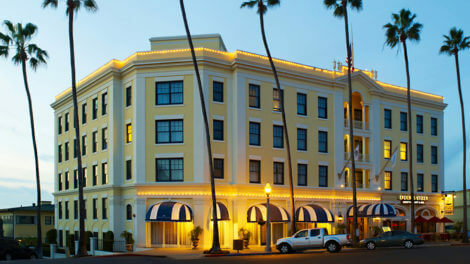 There are a few hotels in San Diego that are specifically known to be haunted. 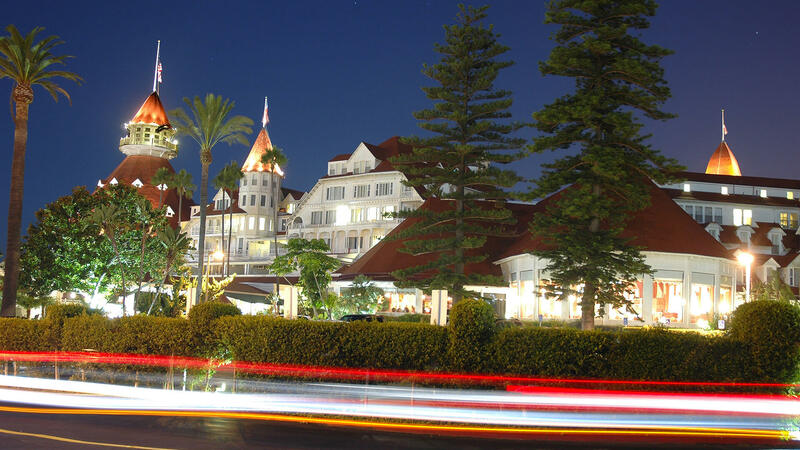 Historic and recognized for the eccentric stories of past residents, the Horton Grand Hotel, the Hotel del Coronado and the Grande Colonial all house a history of resident ghosts. This gambler stayed in the hotel as a guest. He got caught up in the betting web and owed lots of money to creditors. After he got shot, he hid inside an armoire in room 309 and was later shot inside that very same armoire. There have been accounts of paranormal activity from flickering lights, shaking beds, misty glows and footsteps in the middle of the night. You’ll need to make a reservation to see the hotspot of room #309. She was the owner of a brothel housed on the same spot as the rebuilt Horton Grand Hotel. She allegedly takes on different forms from an apparent floating mist to a cold chill and even emits a warm and friendly feeling of a happier ghost. 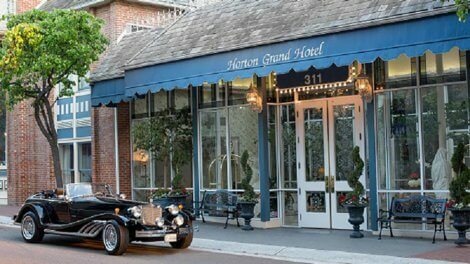 The Horton Grand Hotel is in the heart of the city’s Historic Gaslamp Quarter. Here you’ll find fabulous and fun restaurants, heaps of shopping and easy access to the Embarcadero that runs directly beside San Diego Bay. Only a short walk away from the hotel, you’ll find the Convention Center (which plays host to the International Comic-Con every summer), Petco Park (home to Major League Baseball’s San Diego Padres) and Little Italy (which houses the city’s largest farmer’s market every Saturday morning). Or continue the ‘spooktacular’ and find a ghost tour that brings out your own inner spooky. Come for the hauntings but stay for the fun. Kate Morgan checked into the oceanfront Hotel del Coronado and waited for a man who never arrived. Five days after checking in under a fake name, Kate Morgan was found dead from a self-inflicted gunshot wound. By calling her ‘beautiful stranger’, the papers kept her name a mystery. ‘Sightings’ have been reported as flashing lights, moving books, pulled linens, footsteps moving around the top floor and even nightly walks on the beach. Coronado Island is home to the North Island Naval Air Station and the west coast training base for the US Navy Seals. 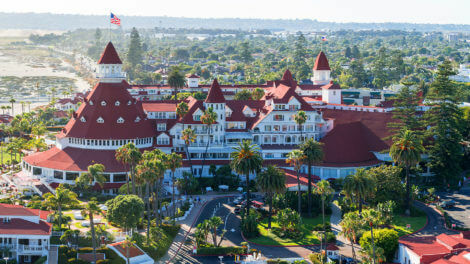 Centered in between the two is a boardwalk with views of the beautiful Pacific Ocean, gorgeous sandy beaches, a fun dog beach and the famed, historic Hotel del Coronado. Grab a sundowner at any of the outdoor bars, taste the sweet sensations of chocolate and ice cream or take in the whimsical creations of Sand Castle Man who stations himself on the beach directly in front of the turret-topped hotel. Each holiday season, come for a skate on the grounds of the hotel where the normal green space between the hotel and the sea is transformed into a frozen pond that fills daily with anxious ice dancers. Grab your favorite hot drink and stay for the nightly holiday lights display or make your own s’mores at the hotel’s sandy set up at Roast. Come for the ghostly magic and stay for the views. Since its inception in 1913, the European-style hotel has seen the likes of locals, military men and Hollywood royalty. ‘Sightings’ have been heard more than seen and they apparently tend to be louder especially on particular military anniversaries. Known as the gem of San Diego, La Jolla is filled with cliff side seascapes, luxurious shopping, artisan cafes and of course, the famous seals. Spend the afternoon in La Jolla Cove and experience a friendly colony of seals that have set up shop amidst the rocks. The seals devote their days to sunbathing, posing for photos and diving through the crashing waves. Take a few moments to sit on a nearby bench, grab a kayak and tour the underwater sea caves, enjoy the endless blues of the coastal views or wander up and down the nearby boardwalk to experience the seaside views of the area. Hang by the beaches, bring your painting supplies and recreate the image in front of you or pack a picnic and wile away the hours by the coastline. If you’re not up for that picnic, head on up the hill to grab a snack at any of the region’s delicious cafes. Come for the spooky but stay for the seals. Sign up to receive the scariest of offers and stay current on sales and events. Traveling in the next 7 days? Receive this limited time offer!